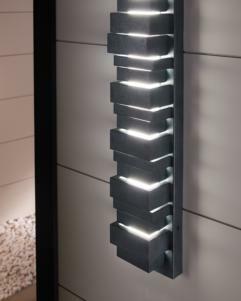 The Ledgend outdoor light wall sconces by Feiss are modern and dramatic, making a significant design statement as visitors reach the front door. Energy efficient and long-lasting LEDs direct light forward through off-set openings inspired by stacked flagstone, as well as shining up and down. Made of Cast Aluminum, the fixture has exceptional durability to withstand the harshest elements. With a Dark Weathered Zinc finish, the assortment includes 5", 18” 26” and 34” LED outdoor wall sconces. (1) LED Integrated Array 32w Max.